John F. Kennedy inspired a lot of music. This is some of the weirdest. Song-poems! A Frank Zappa composed/produced surf record! A singing psychic! Mexican music! 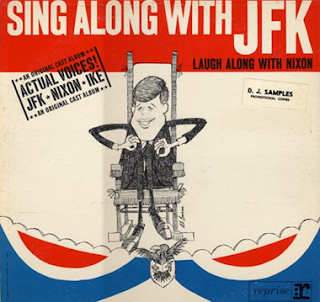 And all 6 tracks from the great "Sing Along With JFK" album that featured pre-sampling tape manipulations of Jack's voice "remixed" with original music and a vocal chorus. You've heard of musique concrete? This is musique ridicule. Thanks for some of these to WFMU's Beware of the Blog, and master blogger Bob Purse.